Are you in need of some serious relaxation after a hard day at work? DriveNow is here to help! Our Therme Erding Relaxation Package allows you and up to three friends to enjoy a day of pure pampering at a discounted rate! The price depends on the number of passengers and the day of the week. * Compared to the orignal DriveNow hourly package price needed for the experience package and the entrance fee to the Spa. **On Bavarian bank holidays, you also need to pay the weekend admission fee.. If you rent a DriveNow car for immediate use, you can book the Experience Package directly in the car. Simply jump in, log yourself in and go to "Experience Packages" in the booking summary. You can now select the package you'd like, enter the number of passengers and book the package and save. That's all there is to it! We'll send you a confirmation via SMS and email with your booking number, which you'll need to show at the entrance. 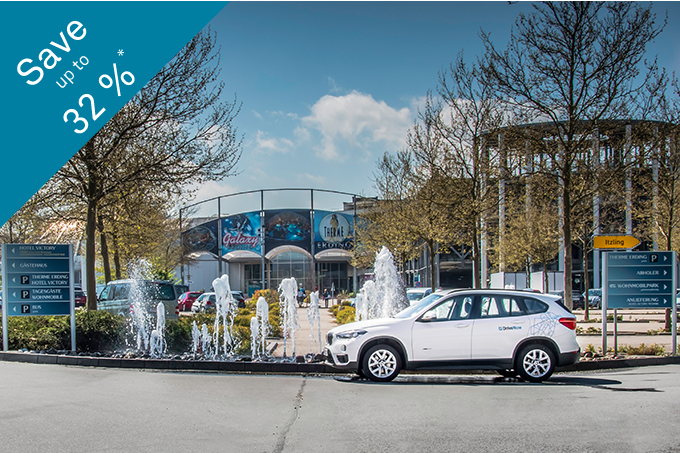 Thats all you need to be able to save when going to Therme Erding!